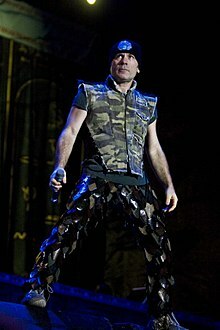 Paul Bruce Dickinson (born 7 August 1958), kent professionally as Bruce Dickinson, is an Inglis sangster, sangwriter, muisicker, airline pilot, author an broadcaster. He is the lead sangster o the hivy metal baund Iron Maiden an is renained for his wide-rangin operatic vocal style an energetic stage presence. This page wis last eeditit on 4 Januar 2018, at 19:54.